Oh full-day school sessions, why do you even exist?! Okay, that's just me being annoying and maybe dealing with separation anxiety issues. Yeah. You didn't read that wrongly. Me, the mommy is having separation anxiety issues. How funny right? When as parents we would think that our kids are the one who have a hard time separating from us. The bub started full-day school on Monday! Even before I told her that she would be starting full-day school we had been talking about it casually. She would tell me that she needs a cot and bedsheets etc. Then when I told her she would be starting full-day school she got all excited and would ask me everyday whether we she was starting "tomorrow". When I said February, she would say "Is it February yet? ", "Is next week February?" etc. Then when it came to the point where she asked me and I said next week, she says "Oh Monday?" -.- You get the point right. Totally anticipating it. Plus she would go on and on and repeat herself everyday of what she needs when she starts full-day school and that she would be sleeping with her friends. It's like I didn't even have to prepare her for it. She already self-prep! I know I should be happy right? Of course I am! But at the same time, like hello!! Young lady stop growing up so fast pleaseee! I'll admit the day before she started full-day school, I was like half hoping she may change her mind..and I was having thoughts like.."hmm since I haven't got everything ready and it would be pretty rushed..maybe I shouldn't let Kaitlin start full-day school tomorrow." You know, procrastinating, putting it off and being irresponsible. I ended up doing the responsible thing and got everything ready for the bub. Like made a list of what to pack and do, packed and re-checked and then wrote a super long message to her teachers. As if she was going to be for like a week, when it's just full-day school. Yeah, I know I can be a little over the top with this kind of stuff, but hey hey it's concerning my daughter right! Of course very important. 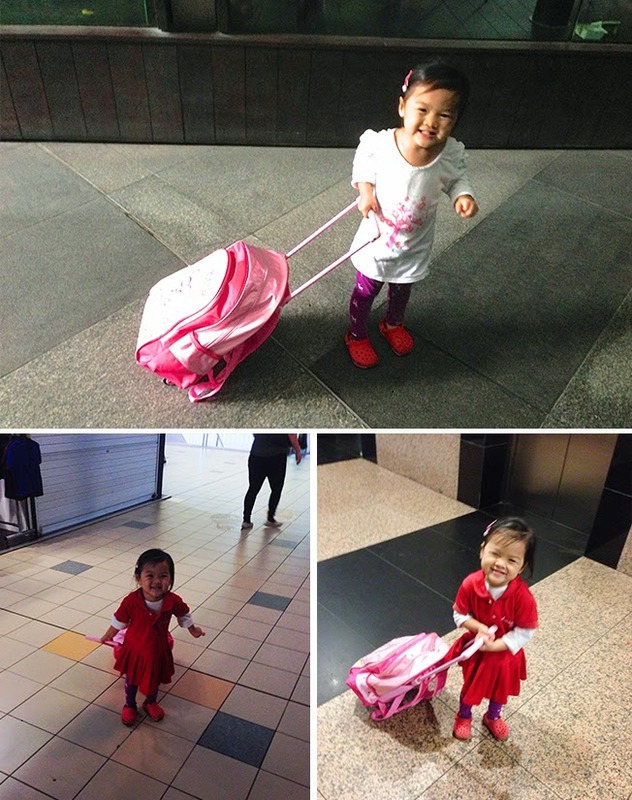 Little Miss Excited was so elated that she could finally use her trolley bag that we got quite awhile back ago! The night before she was like telling me she wants to pull it the next day and reminding me to pack this and that for her into her bag. She even wanted to pull it around the house! Uh, the below picture was when we had just bought the bag. As you can tell..it was really some time back..when he hair was super short, and she was more baby than toddler-like lol! She was so enthusiastic about pulling it that she wouldn't even let me help her. We got to school and said goodbye just like any other day. I reminded her that I would only be back in the evening to fetch her and she said "okay, you wait for me outside ok."
At that moment, my heart was half going like "NOOOOOO... don't go in" but well, of course she went on in and I was thinking that she probably doesn't know what full-day school really means and when she realises it may be too late and she may regret. Evening time came and I reached school punctually at 5pm to fetch her. I couldn't wait to see my baby girl! I kept peering though the glass doors that when she appeared I had to like double confirm with myself that it was her! 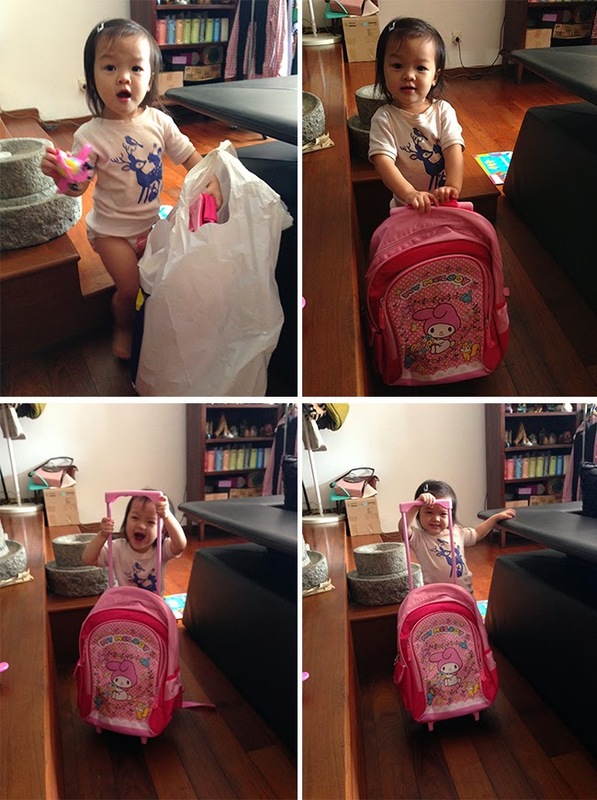 Plus what's more the teacher said she will bring Kaitlin out but Kaitlin came out on her own with her two huge bags! I guess the bub was as excited to see me as I was? Or maybe I'm just comforting myself. Whatever it was..ahhhhhh my baby!!! I asked her about school and she was just a huge ball of energy. I was super worried she would get cranky later on that evening but that didn't happen. Phew!! I guess perhaps she was behaving in class the whole day that when she saw me she felt like she could "unleash" and be herself again! On our way home, she wouldn't let me help her with her trolley bag again! Ahh..the wonders of a trolley bag. It makes your kids more independent than they previously were! That evening/night I did tell her a few times here and there that tmr would be a full day of school again and at times she would say "noooo...i don't want" but in a cheeky voice. I was thinking if she would cry the next day or resist, but thankfully no! Needless to say, that night she fell asleep pretty fast! Kaitlin was excited to go to school again! She wanted to wear her shades to school that day. Yeah, she thinks she's a super cool kid. 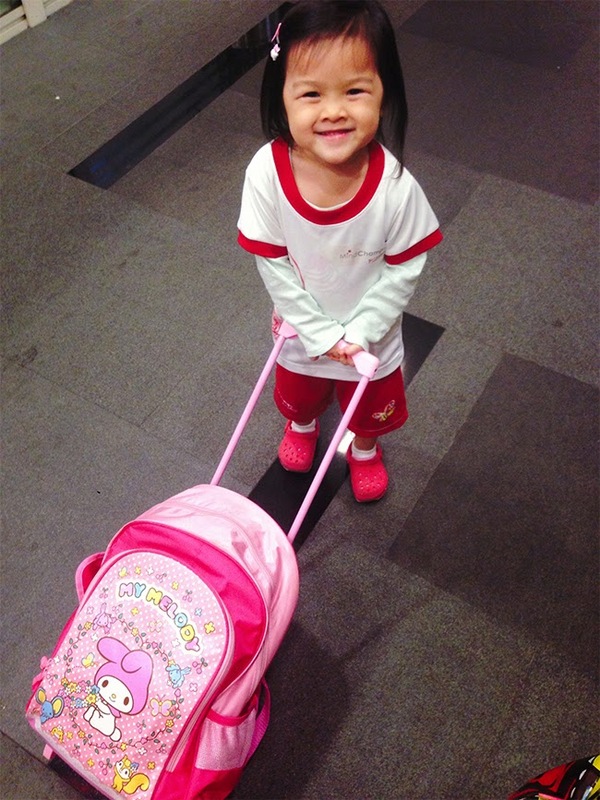 Imagine her pulling her trolley bag and with shades on, yeah she totally looked like some mini diva. I kept asking her if she had to wear them shades and she said "YES!!!" so okay fine, look like a diva then. When we were saying our goodbyes, she hugged my leg and said I love you and wanted to do a Hi-5! She told me to be sure to pick her up later on. I delivered her snack lunchbox but didn't talk to her teachers so I was anticipating picking her up! Great news that day was that Kaitlin took her nap. She did take awhile to fall asleep, but she slept for about an hour. Didn't wake up cranky and was behaving normally. Woots. Didn't think that she would be able to nap on the second day! Yeah, totally goes to show that kids adapt real fast. I picked her up that evening and she was all hyper again. Again, the wonders of the trolley bag! She can walk home with no complains, and never asks to be carried. I guess I got to thank whoever invented the trolley bag eh. Kaitlin was just as excited as the previous days! When we said goodbye, she hugged and kiss me and said I love you then she told me "See you later ok! You wait for me outside." It was pretty funny that the teachers laughed. As if she was the parent telling me goodbye and being all adult-like and cool with it. Like hello?! Sometimes I wonder why she is more fine with it than I am? And like how she can be so "dong shi". I got two calls from her teacher today. I swear everytime my phone rang and I saw her school's number I would go "oh s**t!". Thankfully the first call was just to ask and tell me about some routine care stuff. The second call though..the teacher informed me that Kaitlin vomitted. Like what?!!! Yeah well she got her temperature taken and she seemed fine. So the teachers think she probably had a little too much to eat. Cos she was drinking milk halfway and talking when she merlion-ed. I immediately asked if she cried and if she was fine and her teacher said that Kaitlin was surprisingly very calm. Then I was like, thank god she was calm and didn't freak out. Must be from all the previous puking incidents she has had since she was young that's why she was so calm about it. Even now when she has eaten a little too much she does puke when she is with us and she just stands there to let you clean her up. I guess in a way those incidents came in useful eh? She did take her nap, though with some patting need. Everything else was alright! Oh and today, I decided to just pack her snack lunchbox into her school bag so I wouldn't have to drop by her school. Kind of helps so I won't be so worried and feel that I'm so near yet so far away from her. It's been three days, and I don't want to jinx it but I think Kaitlin has been doing really well adjusting to full-day school! 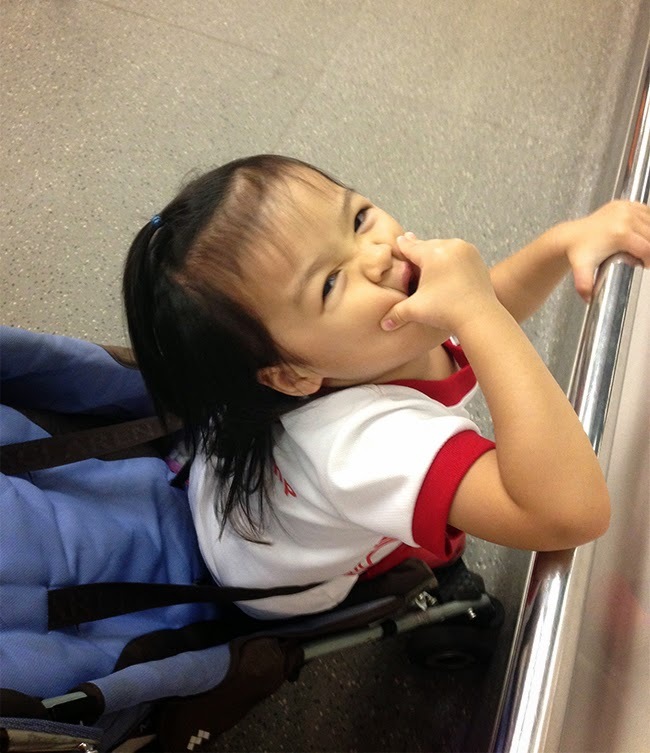 It's such a relief to hear from her teachers that she's been adapting well. Definitely makes me feel less worried and stressed out. I hope things continue to be this good if not better! Maybe perhaps I should have switched her to full-day school earlier and started on my own stuff, be it studying or working. But you know what? I think this time I did make the right choice in choosing when to start her on full-day school. At a time when I felt that she was really ready for it. When she understands and feels more assured and comfortable in school with her teachers and friends. When she didn't have to deal with communication issues like during her terrible twos phase. So I don't really care what other people think or whatever views other people have. 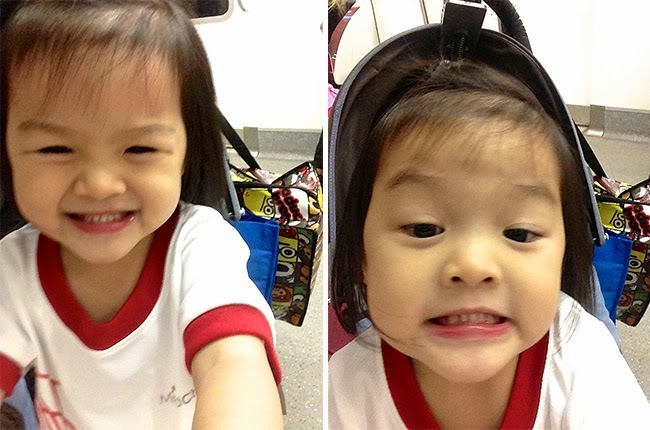 All I can say is that I don't regret my decision of not letting her start full-day school earlier. Sure, that meant giving up on certain things, others may think it's over pampering or what not, but I don't care and I feel that giving up on other stuff to spend more time with her and give her the undivided care is all so worth it. All I can say is trust your own gut feeling as a mom to your own child. Her teachers have previously asked me to consider full-day school. Especially when she was very reserved and shy in the past, they felt it would be more beneficial for her to be in school the whole day as she has more interaction with her friends. Well, I didn't think it was a good time to start, and well even without going to school whole day, Kaitlin eventually opened up at her own pace. Which goes to show that some kids progress differently but they will eventually get there. I feel it's better for her to get to it on her own where she feels more comfy and less pressurised than to be forced or led to doing something. Daddy Li has also all along been asking me to switch her to full-day school but I've always been putting it off. In fact it was only with this year that because of the curriculum that I switched Kaitlin to full-day school. She would be missing out on a large chunk of what's being taught in class if she only went half-day. Of course I had to deal with that and the dilemma of her being a child and that she should be enjoying her childhood. I came to the conclusion after seeking Kaitlin's opinion. Not once, but quite a number of times. She seemed to want to stay in school with her friends and to play and learn more in that environment. She also seemed to enjoy school and her teachers quite a lot, plus with the feedback from her teachers she was generally a well-behaved girl in school, so why not give it a try I guess? Crossing fingers that things stay good and Kaitlin doesn't end up hating school or that her attitude changes in school as she spends more time there and may get influenced by her peers. For now, babygirl, you've been doing such a fabulous job and I'm oh so proud of you *thumbs, fingers and toes up* for you!